On Sunday 29th of May, the bank holiday weekend, we are celebrating the great art of aperitivo. Our friends at Behind This Wall in Hackney invited us along to host a night in their beautiful bar and we couldn’t think of a better way to do it than with an extended apero. The bar was built by the guys from scratch, is full of nooks and crannies and comes complete with Factory Records’ producer Martin Hannett’s old Tannoy Gold soundsystem, which will ensure that the tunes are as radiant as a Mediterranean sunset. We’ll be pouring the kind of wines we like to drink to get the night started. Light, bright and nimble wines. Appetising drinks that offer refreshment in spades. Expect new wines, some old favourites and Marino Colleoni’s rosato from magnum. The guys from Behind This Wall have created a couple of special cocktails for the night using organic ingredients, vermouth and chinati from Torino’s finest, Mauro Vergano and fizz from our growers. 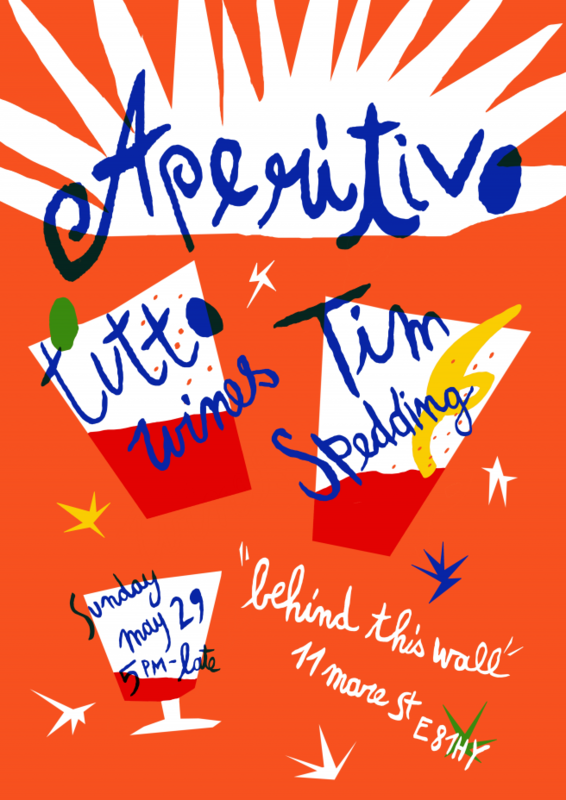 Apero ain’t apero without snacks, so we’ve invited our friend and chef Tim Spedding along to take care of those. Tim’s keeping it old school and will be sending out plates with good drinking and good times in mind. He’s thinking the likes of homemade salumi, anchovies with lemon and olive oil, wild garlic arancini, crudo with blood orange & garum, grissini with fennel seeds, rosemary & lardo, courgette fritters with ricotta and basil and mortadella panini to satisfy your hunger after a couple of drinks.